Double pinch three rolls are economic plate rolls that are easily operated. The plate is held in place between the top and side rolls while the side rolls move vertically to create the bend. The side rolls are positioned to the right and left of the top roll and are on the same axis. The axis of each roll helps make the bend. The “back” side roll (at the far side of the feeding point) also functions as a back gauge to square the plate for proper alignment. This eliminates the need for someone to assist the operator. As probably the most predominant plate roll design in the market place, three roll machines are the bending work horse of the fabrication industry. 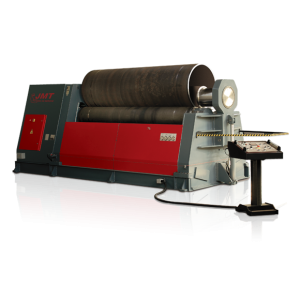 Because of the basic design of three roll plate roll machines, they are more compatitively priced than their four roll cousins. While being of smaller stature these plate rolls are no wanna be’s. Three roll double pinch machines do not require the operator to remove, flip, and then try to square the plate a second time after pre-bending, as is the case with three roll initial pinch machines. Keeping the material in the double pinch machine makes it 50% more efficient than three roll initial pinch machines, and allows a cylinder to be rolled to the required diameter immediately following pre-bending. Cone rolling is easier on a double pinch three roll machine, the side rolls can be tilted to establish the cone angle. The mechanical and hydraulic systems on JMT-HRB3 machines are designed by experienced engineers who utilize parametric 3D engineering technology as well as implementing mechanical and kinematic analysis in the design. All mechanical, hydraulic, and electronic systems are designed and tested by electrical and mechanical engineers and will pass a rigorous set of parameters before the machines will begin production. The JMT-HRB3 machine body has been strengthened and lowered to minimize twists and deformation of the plate. This robust body is joined by steel bars to the sturdy machine frame. The machine body, frame and steel bar connections are all are stress relieved after the welding operation. The whole body is machined with 5-axis CNC machining centers utilizing a fixed single reference point. This allows for parallelism of all axes and precise surfaces, as well as longevity and precision of the critical characteristics of the machine. The type and position of each rolls is selected after extensive engineering, testing and evaluation periods. The side rolls are guided by swing beds which allow them to act as two independent axes moving on a curved shape orbit. This system allows bending to a minimum work piece diameter of 1.1 x the top roll diameter, dependent on the capacityof the machine Side rolls approach the top roll on a curved movement which allows perfect pre-bending as well as spring back minimization. The rolls are guided with spherical roller bearings. This guidance system requires less lubrication and assures long-term precision. Rolls with a capacity of less than 1 inch pre-bend come standard with planetary guides (Note: A rectilinear-style machine in this size is an option.) The type and position of each rolls is selected after extensive engineering, testing and evaluation periods. The side rolls are guided by swing beds which allow them to act as two independent axes moving on a curved shape orbit. This system allows bending to a minimum work piece diameter of 1.1 x the top roll diameter, dependent on the capacity of the machine. Side rolls approach the top roll on a curved movement which allows perfect pre-bending as well as spring back minimization. The side rolls on rectilinear machines are guided by rectilinear guides giving them the strength to pre-bend and roll heavy plate. Side rolls approach the top roll on a straight movement which transmits force directly through the machine, giving greater strength. Each side is individually leveled and controlled electronically. The most important elements of a plate roll are the rolls themselves. Most machines in the market have weak rolls that deform during the bending process when small diameters of 5x the top roll are reached. JMT uses highly durable forged carbon steel (stress-relieved 4140) rolls that are machined by high precision CNC lathes. Working surfaces of the rolls are CNC induction hardened to 58 RC with hardness tests performed at varying points on the rolls. Rolling 1.5 x the top roll diameter is acquired easily. The rolls are machined with an optimum crown to compensate for deflection of the rolls during the bending process. The hydraulic components installed in JMT’s HRB series plate rolling couldn’t have a better pedigree. Almost to the last component, every part of the hydraulic system is world renowned Bosch-Rexroth componentry. In fact Bosh-Rexroth assisted in the system design and created specialized components just for the HRB’s hydraulic system. An added benefit of their involvement is the availability to source these components locally, if replacement components are ever needed. Also included in the original design of the hydraulic system is the industry’s strongest hydraulic braking system designed to prevent plate slippage during bending. To keep the rolls running true for years and years of service, are spherical bearings sourced from the best bearing manufacture’s in the world. Hydraulic roll crowning compensation allows for the rolling of different thicknesses of material with minimal deformation of the plate or sheet. Not to be out done, the electrical system can boast componentry from the world’s highest quality manufacture’s as well. Open up the main electrical panel and you will be greeted by Siemens components everywhere you look. Siemans needs no introduction, arguably the highest quality electrical components on the planet, and guess what, you can source them right down the street from you facility, if a replacement is ever needed. A standard equipment on the HRB-3 a p.l.c. controller handles the task of operating the machines movement assisted by d.r.o.’s to show roll position. As is the case with all JMT-USA plate rolling machines the HRB-3 plat rolling machines are all C.E. certified. In the case of plate rolling machines JMT can provide but is not limited to; side and top support systems, vertical machine configuration’s, Specialized surfaces for any or all rolls, large custom roll side supports, and last but certainly not least, automatic load/unload systems made to customer specifications. Give JMT-USA an opportunity to “roll out our capabilities” for you, we are fairly sure you will be glad you did. For further information, and assistance in selecting the appropriate machine for your needs, do not hesitate to contact us and we will put you in touch with the JMT-USA sales representative in your area.